The Bronx turned into a house of horrors, so maybe Oriole Park at Camden Yards will treat the Yankees better. The Bombers enter Yankee Stadium south for a Thursday opener before Saturday night and Sunday matinee starts against the high-flying Birds. Predicted to be easily the worst team in baseball this season, the Orioles have scrambled their way to four wins in six games. They put together a four-game winning streak starting with their second game in the Bronx and carrying through until Wednesday afternoon in Toronto. Now, the lackluster O’s carry a share of the AL East division lead into their home opener, trying to take another series from the Yankees. Alex Cobb is back for the home opener, so that leaves just Mark Trumbo (knee, 60-day IL) and Austin Wynns (oblique, 10-day IL) as the only fallen Birds. Changing it up with the previews and going to the starters first. The Orioles haven’t announced starters for Saturday and Sunday yet, though Dylan Bundy will assuredly start and Andrew Cashner or David Hess should take the other game. A late spring groin injury scratched Cobb from Opening Day honors, but the right-hander is back in time to face the Bombers at Camden Yards. His 2018 was disastrous in large part due to a late start. The former Rays starter missed almost all of Spring Training waiting in free agency and didn’t sign until March 21. He pitched to a 13.11 ERA in three April starts, setting the tone for an awful first half in which he went 2-12 with a 6.41 ERA. Cobb, however, rebounded in a big way in the second half, looking like the changeup-heavy pitcher he was before. 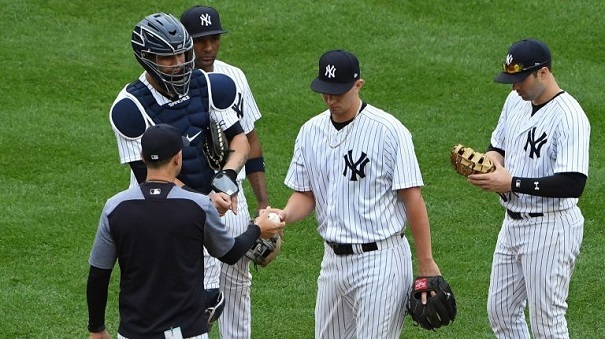 Before a blister issue limited him to two innings and four pitches in his final two starts, respectively, he pitched six innings and allowed two or fewer runs in six of seven outings, including two representative outings against the Yankees. The 31-year-old relies upon his sinker and split-fingered changeup, mixing in a fair number of curves as well. Thanks to the changeup, he has historically had reverse splits and 2018 was no exception, something a healthy Yankees lineup could punish. His groin injury and this being his first start of the year, he’ll likely be limited in his pitch count. I’d expect Dylan Bundy to get the call in this start after Nate Karns as an opener started Wednesday. Bundy labored through 11 outs in his first start of the year, an Orioles win thanks to southpaw John Means’ strong relief. The right-hander, however, struggled with control by issuing five walks. He loaded the bases twice, getting out of it once while Means allowed his inherited runners to score in the other case. Still, Bundy fanned seven Yankees, including two punchouts of Aaron Judge. Bundy is highly susceptible to the long ball, particularly with his home games at OPACY. Still, his normal strikeout and walk rates are passable and make him the most promising starter in the O’s rotation. Bundy, 26, had a 17.3 K-BB% last season and, outside of opening week this year, generally avoids free passes. Miguel Andujar and Giancarlo Stanton accounted for three of the seven baserunners against Bundy on Sunday, so he’ll be facing a very different lineup this time around. You probably remember Cashner’s start on short rest from Opening Day, so I’ll give you the lowdown on David Hess, who allowed no hits over 6 1/3 innings against the Blue Jays in his first start. Of course, the Orioles bullpen couldn’t finish the no-hitter, blowing it two batters later. Hess has faced the Yankees twice before, allowing home runs to Aaron Hicks and Luke Voit in an otherwise fine five-inning start last season. The other outing came on Opening Day, when he had two scoreless innings of relief. ?Your browser does not support iframes. Davis will likely sit against either Paxton or Happ with Rule 5 pick Drew Jackson shifting into the outfield and Mancini to first base. Sucre has gotten almost all the playing time behind the plate while center fielder Cedric Mullins, a lefty, should start on Sunday at least. As Mike pointed out, this team has one player you’d expect to be above-average at the plate (Mancini). The veteran Villar could be a positive contributor and the rest are young, Rule 5 picks (Martin is the other) or downright bad. New manager Brandon Hyde has been flexible in deploying his relievers at any point in the game, so he’ll likely have his best pitcher, Mychal Givens, in during the highest-leverage spot, or whenever Judge is due up. He hasn’t pitched since throwing 49 pitches (!) Sunday, so he should be fresh if that didn’t injure him. With Wednesday’s opener game, Jimmy Yacabonis and former Yankee farmhand Matt Wotherspoon each tossed two innings while Richard Bleier got five outs on 14 pitches. That leaves Miguel Castro, Paul Fry and Means ready to go for the opener and, with Friday’s off-day, the rest of the bullpen should be fresh for the weekend. Basically every pitcher gave the Yankees trouble last weekend, though Givens is certainly the pitcher with the best track record. Can the Yankees finally catch a break? This one is simple, but can the Yankees do what they’re supposed to do, win a series against a bad team and not lose another player in the process? And can someone other than Judge, LeMahieu and Ottavino step up? Who looks like a keeper on the Orioles? Fun idea to muse upon: Which of these O’s will be on the next good Baltimore team? Maybe Mancini and then who knows? I’m a sucker for a Rule 5 pick, so I want to see more and more of Martin and Jackson to see if one of them could be anything. They didn’t impress in the first series. One down, 161 to go. For the second year in a row, the Yankees kicked off their schedule with a win, 7-2 over the Orioles. It marked the first time in more than a decade they’ve had back-to-back season-opening victories, since winning four in a row from 2005-08. The seven runs scored were their most in a win on Opening Day since 2007 when they beat the Rays 9-5. Luke Voit got the party started early with a three-run first-inning dinger, crushing an 87 mph hanging slider 428 feet into the centerfield seats. Last year he struggled to drive breaking pitches, posting an average exit velocity of just 88 mph while whiffing on 40 percent on those offerings. He saw 217 curves and sliders in 2018, and cranked just one of them out of the park. Thursday’s home run gave him 15 homers in his first 40 regular-season games with the Yankees — a 162-game pace of 61 homers. He added another RBI when was plunked with the bases loaded in the fifth. #FunFact alert! Voit is the third Yankee cleanup hitter with at least four RBI on Opening Day, joining Alex Rodriguez (2006) and Yogi Berra (1956). Masahiro Tanaka, making his fourth career Opening Day start (the most by a Japanese-born pitcher), was solid and efficient in his 83-pitch outing, allowing two runs (one earned) while striking out five and walking none in 5 2/3 innings. He earned our Obscure Yankeemetric of the game for that effort, becoming one of three Yankee Opening Day starters to give up no more than one earned run with at least five strikeouts and no walks. The others: Catfish Hunter (1977) and Mel Stottlemyre (1968). There will be no perfect season in the Bronx. Bummer. Cold bats and sloppy defense are a good recipe for a loss, and the Yankees followed that script to near perfection on Saturday afternoon in 5-3 defeat. Despite putting 16 runners on base, the Yankees scored only three runs. As frustrating as the team’s situational hitting was last year, they produced that poor combo — more than 15 baserunners and three or fewer runs in a game just once (5-3 loss to Braves on July 2). 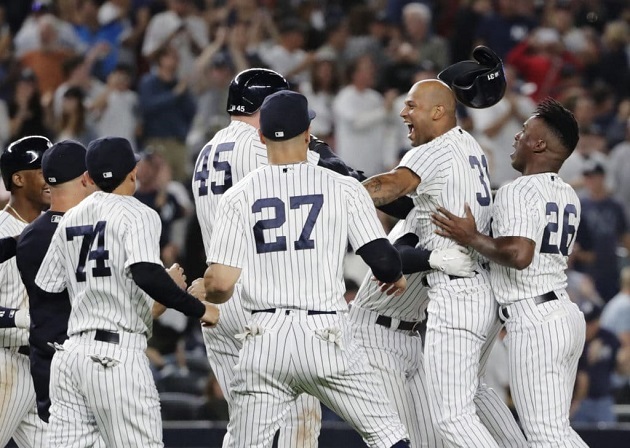 The newcomers provided most of the highlights as DJ LeMahieu got his first hit and RBI as a Yankee, Troy Tulowitzki smoked his first home run in pinstripes and James Paxton had a strong debut on the mound. Paxton showed off his impressive fastball in holding the Orioles to two runs (one earned) on four hits with five punchouts in 5 2/3 innings. He kept the pitch away from the heart of the zone, getting a bunch of called strikes on the edges with the four-seamer while also elevating his heater for swinging strikes. Last year Paxton ranked ninth among starters (min. 500 pitches) with a 25.6 percent swing-and-miss rate on his four-seam fastball — and he matched that number on Saturday as the Orioles swung at 32 of his four-seamers and whiffed eight times (25.0%). Tulowitzki’s longball was a rare 358-foot opposite field solo shot in the ninth inning. Tulo has plenty of pop — he is one of seven players in MLB history with at least 200 homers as a shortstop — but most of that has been pull-side power in recent years: 45 of his 48 homers from 2015-17 went to left field. With a chance to salvage a series win against the Orioles on Sunday afternoon, the Yankees again failed miserably in clutch situations and suffered another disappointing loss, 7-5. This is the second straight season they dropped an early-season series at the Stadium against the Orioles. Over the last two seasons, they are 2-5 vs the Orioles in April and 11-4 vs them in May thru September. The Yankees are also 5-7 at home vs the Orioles since the start of last season, the only team they have faced at least five times and have a losing record against in the Bronx. In losing the final two games, the Yankees went 5-for-21 with runners in scoring position and stranded a combined 25 baserunners (11 on Saturday and 14 on Sunday). It was their most in a two-game span since June 12-13, 2017 when the also left 25 guys on base in the first two games of a series against the Angels. They actually split those two contests, so to find the last time the Yankees stranded 25-plus men in a two-game stretch and lost both games, you have to go back nearly three years to April 15-16, 2016 against the Mariners. Gross. One player who has avoided the RISP-fail plague to start the season is DJ LeMahieu, who had two hits and an RBI for the second straight day. That effort earned him our Obscure Yankeemetric of the game, becoming part of an eclectic group of six players to have two-plus hits and at least one RBI in each of their first two games with the Yankees. The other five legendary names: John Olerud (2004), Don Slaught (1988), Hector Lopez (1959), Joe DiMaggio (1936) and Pat Collins (1926). Giving up three homers to the O’s didn’t help the winning cause, either, as J.A. Happ was tagged for two of those longballs and Stephen Tarpley coughed up his first career homer as a major-leaguer. In 69 2/3 innings with the Yankees (including playoffs), Happ has given up 13 homers, or a rate of 1.68 per nine innings pitched. If he posted that over an entire season, it would be the second-highest homer rate by a Yankee pitcher that qualified for the ERA title (highest is 1.77 by Masahiro Tanaka in 2017). Welcome to Opening Day 2019. The Yankees begin the new season at Yankee Stadium this afternoon. The Orioles are in town for the three-game, four-day season-opening series. Tomorrow is the requisite “off-day after Opening Day in case Opening Day gets rained out” off-day. I like to call it “overreactions from Opening Day” day. At this time tomorrow, the Yankees will be either on their way to the World Series or doomed forever. Anyway, time to preview the series. There is no story so far, obviously. The Orioles lost 115 games last season, fifth most in baseball history, and they didn’t do much over they winter. Front office changes took priority over roster changes. The O’s are less talented now than they were last year — remember, they had guys like Manny Machado, Zack Britton, Kevin Gausman, and Adam Jones for at least part of last season — though I have a real hard time believing an MLB team can lose 115 games in back-to-back seasons. They’ll be (slightly) better this year almost by default. The Orioles went 12-17-3 during Grapefruit League play, if you care about such things. Scheduled Opening Day starter Alex Cobb exited his final spring tune-up start with a groin injury over the weekend, forcing the O’s to scramble a bit with their rotation. Cobb is already on the 10-day injured list. So is backup catcher Austin Wynns, who has an oblique strain. Mark Trumbo is rehabbing from offseason knee surgery and he’s on the 60-day injured list. He’s not coming back anytime soon. Cobb and Wynns could be active when the Yankees and Orioles play again next weekend in Baltimore. According to ZiPS, the Orioles have one projected above-average hitter. That’s Trey Mancini with a 105 OPS+. Their second best hitter is a free agent (Danny Valencia at 96 OPS+), their third best hitter is injured (Mark Trumbo at 96 OPS+), and their fourth best hitter is a prospect in Triple-A (Yusniel Diaz at 95 OPS+). Five of their seven best hitters by ZiPS projected OPS+ aren’t on the active roster. Seems bad. The redder the red, the more above average the player was in that particular category. The bluer the blue, the more below average. Players with an asterisk (*) next to their name didn’t play enough to qualify for the Statcast leaderboards last year. Point is, wow are the Orioles bad. I guess Nunez could be a guy who capitalizes on the extra playing time that comes from being on a terrible team? To me, Mullins is the only lineup regular who has a chance to be part of the next contending Orioles team. Thanks to Cobb’s injury, Cashner will start Opening Day on short rest. He threw two innings in a spring tune-up start this past Sunday. Cashner was pretty terrible last season, throwing 153 innings with a 5.29 ERA (5.32 FIP) and underwhelming peripherals (14.5 K%, 9.5 BB%, 40.4 GB%), and lefties and righties hit him equally as hard. His stuff doesn’t wow like it once did either. Cashner shut the Yankees down last April (one run in six innings), then they roughed him up the three times they faced him thereafter (12 runs in 19.1 innings). And you know what that means today? Nothing. It means nothing. Over the last four seasons Cashner has a 4.51 ERA (4.61 FIP) in over 600 innings. That seems more meaningful. 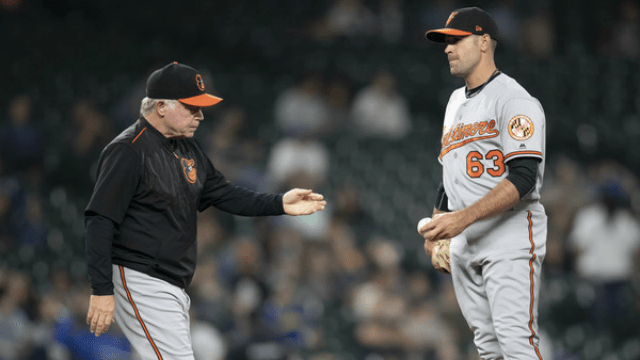 The Orioles have Bundy listed as Saturday’s starter, though Joe Trezza says they might use Nate Karns as an opener instead, which is awfully rude for series preview writing purposes. Bundy, who is still somehow only 26, is coming off a season with a 5.45 ERA (5.17 FIP) and an MLB high 41 home runs allowed in 171.2 innings. His strikeout (24.5%) and walk (7.2%) rates were pretty good. His ground ball rate (34.0%) was not, and lefty batters annihilated him (.399 wOBA). Not much to see stuff-wise either. Bundy made two starts against the Yankees last year and allowed nine runs in nine innings. They hit the poor kid hard every time they face him. He’s always approaching 80 innings in the third inning, it seems. As for Karns (vs. Yankees), he has not pitched in a big league game since May 19th, 2017, due to elbow issues (inflammation and nerve irritation). He’s a fastball/curveball guy who was quite effective against righties the last time he did pitch, which I guess makes him a good opener candidate against the righty heavy Yankees. Still no word Sunday’s starter. David Hess and Mike Wright are the actual starting pitcher candidates. Paul Fry has been mentioned as a possible opener, though throwing an unspectacular lefty reliever at Aaron Judge and Giancarlo Stanton seems not smart. I suppose Karns could open back-to-back days. That’s a possibility. Hess (vs. Yankees) had a rough MLB debut last year, pitching to a 4.88 ERA (5.80 FIP) in 103.1 innings. The strikeout (16.3%), walk (8.2%), and ground ball (34.5%) rates were not good, and he served up 22 home runs in those 103.1 innings. Yikes! Hess is a fairly generic fastball/slider/changeup guy who had a negligible platoon split last year, which in this case means righties and lefties hit him equally hard. Wright (vs. Yankees) has been around for a few years now as an up-and-down swingman. He finally ran out of minor league options and will stick on the big league roster for good, at least for the time being. Last season he had a 5.55 ERA (4.79 FIP) with yucky peripherals (19.1 K%, 9.3 BB%, 35.4 GB%), and those numbers are actually better than his career numbers (5.75 ERA and 5.21 FIP). Yeesh. Any team and any pitcher can beat any other team on any given day in this sport, but geez, the Orioles aren’t exactly going to make their opponents sweat with the starters they’re set to run out there. On paper, the Yankees have a clear pitching advantage — a clear everything advantage, really — this series. Whether it translates into wins remains is another matter. Only seven relievers with that rotation? Bold. Castro, Means, and Yacabonis can all go multiple innings though, so I guess that keeps them covered. Araujo was a Rule 5 Draft pick last offseason. He missed a bunch of time with elbow trouble last year and needs to spend 14 days on the active roster this year to satisfy the Rule 5 Draft requirements. Once that happens, Araujo can be shuttled up and down like any other rookie. 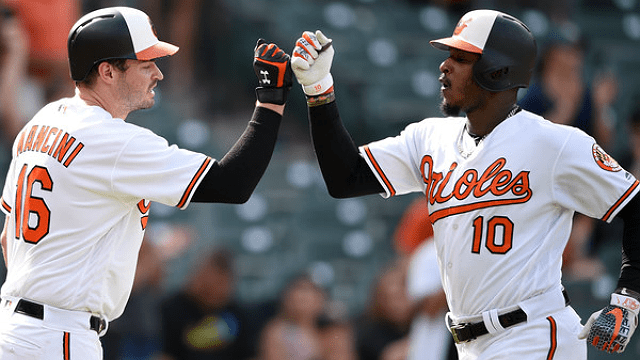 Givens and Bleier give the Orioles a respectable end-game duo. Givens is hell on righties and my guess is he’ll be matched up against Judge and Stanton, regardless of whether it is the eighth or ninth inning. Bleier? He’s the one who got away. We’ve spent some time the last few weeks talking about players the Yankees regret trading and Bleier is one. They sent him to the O’s for cash in February 2017. Since then, he has a 1.97 ERA (3.80 FIP) with a 65.3% ground ball rate in 96 innings. Oh well. Can’t win ’em all. Officially announced three-year deal with LHP Zach Britton. RHP A.J. Cole claimed off waivers by the Indians. IF Hanser Alberto claimed off waivers by the Orioles. Signed RHP Drew Hutchison to a minor league deal with an invitation to Spring Training. Signed OF Matt Lipka to a minor league deal with an invitation to Spring Training. The Yankees haven’t announced the LeMahieu signing yet. That is still pending a physical and it’ll be a few days. The Britton deal is technically a three-year contract, but, functionally, it is a two-year deal with a two-year club option and a one-year player option. Two years vs. three years doesn’t change anything with regards to the luxury tax. Britton still counts as $13M against the luxury tax payroll annually. Cole, 27, was designated for assignment last week to clear 40-man roster space for Troy Tulowitzki. I thought the Yankees might be able to trade him for cash or a player to be named later, but no luck. They lost him on waivers to the Indians for nothing. Oh well. Cole had a 4.26 ERA (4.92 FIP) with 29.2% strikeouts in 38 innings for New York last season. He came over in a cash trade with the Nationals and had a few good weeks before falling apart. Alberto was designated for assignment to clear a 40-man roster spot for Britton, then was claimed by the Orioles a few hours later. I thought it was kinda weird the Yankees would unload infield depth given Troy Tulowitzki’s general fragility, then a few hours later the LeMahieu news broke, and it all made sense. The Yankees claimed Alberto from the Rangers a few weeks ago. He’s a great defender but not much of a hitter. Now he’s an Oriole. Hutchison, 28, started Opening Day for the Blue Jays at Yankee Stadium only four years ago, but injuries and ineffectiveness have dogged him since. He had a 6.75 ERA (6.42 FIP) in 42.2 innings with the Rangers and Phillies last season, and a 2.14 ERA (3.29 FIP) in 42 Triple-A innings. For what it’s worth (nothing), I signed Hutchison to be Triple-A Scranton’s veteran innings guy as part of my 2018-19 Offseason Plan. Now the Yankees have done the same. The 26-year-old Lipka is a former high draft pick (35th overall in 2010) who stalled out with the Braves. He spent last season in Double-A with the Giants and hit .240/.329/.352 (91 wRC+) with four homers and 21 steals. Lipka has a little Triple-A time and I imagine he’ll spend the coming season as the roving Double-A and Triple-A depth outfielder. He’s not a prospect anymore. Just a roster filler signing. Hutchison and Lipka join catcher Ryan Lavarnway, infielder Gio Urshela, lefty Rex Brothers, lefty Danny Coulombe, and outfielder Billy Burns as minor league contract depth pickups this winter. You never know with these things, but that might be it for the non-roster signings. If nothing else, the Yankees have addressed all Triple-A Scranton’s roster needs. Survive and advance was the theme of Friday’s near-disaster series opener, as the Yankees staved off a late rally to beat the Orioles 10-8. The Yankees led 6-0 entering the fifth inning and 9-4 at the start of the eighth and somehow still needed Dellin Betances to get three outs in the ninth for the save. 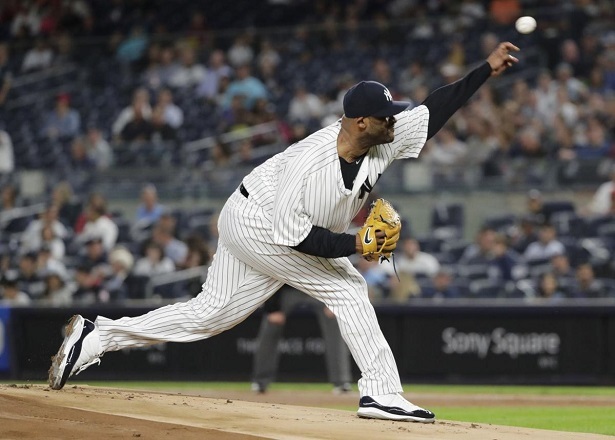 CC Sabathia rebounded from a terrible start last week against the Blue Jays, limiting the Orioles to two runs across six innings. It snapped a 10-start winless streak vs. the O’s, the longest by a Yankee pitcher against them in the Divisional era (since 1969). And it was his 128th win as a Yankee, matching Jack Chesbro for 11th place on the franchise all-time list. This was the first game in franchise history that they Yankees had three guys give up at least one homer while pitching no more than one-third of an inning. Despite having three regulars on the bench, the Yankees still were able to explode for 10 runs on 10 hits. Aaron Hicks was one of the stars, reaching base four times (and scoring four times), while driving in a couple runs with a two-run homer in the fourth. It was his 25th home run, giving the Yankees five 25-homer players. That’s a nice round number …. Aaron Hicks is 5th Yankee this season with 25+ HR, tying the franchise record set in 2009. MLB record is 6 by 2003 Red Sox. And a #FunFact to celebrate the underrated Hicks: in the last two decades, the only other Yankee leadoff batters to score four or more runs and hit a homer in the same game were Johnny Damon (April 29, 2006) and Derek Jeter (June 21, 2005). On September 24, 1999, Alfonso Soriano cemented his name in the Yankee record books with his first career hit, a walk-off home run in the bottom of the 11th against the Rays that wrapped up the AL East title for the Yankees. Less than 24 hours removed from one of the most exhilarating wins of the season, the Yankees crashed back to earth and capped off the Bronx version of the regular season with a depressing, uninspiring loss on Sunday afternoon. Thanks to another bullpen implosion they coughed up an early 3-0 lead, and the offense went M.I.A. after the first inning as it was held to no runs and just two hits in the final eight frames. The end result: a miserable 6-3 defeat to the 110-loss Orioles. The turning point came in the sixth inning when A.J. Cole was called on to protect a 3-1 lead, and three batters later he was booed off the mound after all three guys scored, with two of them sending the ball into the seats. Only one other pitcher in franchise history had an outing at Yankee Stadium (old or new) in which he got no outs while giving up at least two homers and three runs: Steve Howe on September 24, 1995 against the Tigers. Rather than end on that miserable note, let’s celebrate another #MiggyMantle milestone. In the third inning, Miguel Andujar belted his 43rd double and 70th extra-base hit of the season. Those 43 doubles are the second-most ever by a Yankee rookie, one shy of the record set by Joe DiMaggio in 1936. Perhaps more impressive is the 70 extra-base hits for a guy as young as Andujar. Since the first Rookie of Year trophy was first handed out in 1947, three other American League rookies age 23 or younger have recorded 70 or more extra-base hits in a season: Nomar Garciaparra (1997), Mark McGwire (1987), and Fred Lynn (1975). Each of those three players won the AL Rookie Year award. After taking two of three from the Red Sox, the Yankees ride high into their final home series of the season. Their reward is a three-game set with the worst team in baseball, the Baltimore Orioles. The Bombers took four games in three days from the Orioles on Players’ Weekend on Aug. 24-26 in Baltimore. Luke Voit and Neil Walker powered the Yankees to an extra-inning win in Game 1 while Zach Britton saved the game against his former squad. The Yanks backed gems from J.A. Happ and Sonny Gray with five homers and 15 runs in the Saturday doubleheader, finally sweeping a twin bill. Voit hit another early homer and the Yankees’ bullpen sealed a sweep in a 5-3 victory. Make sure to read Katie’s Yankeemetrics post for more information. Mark Trumbo, Pedro Araujo, Richard Bleier, Gabriel Ynoa and Luis Ortiz are all done for the year. Chance Sisco is in concussion protocol and has missed the last three games. The Orioles’ rotation is in flux as both Andrew Cashner (left knee discomfort) and Alex Cobb (blister) have missed recent starts. The Orioles are a putrid 44-108. Their win on Wednesday ensures they won’t break the AL record for losses in a season, but they have already set a franchise-worst mark with the 108 defeats. This team is set up to be awful for a while as they are just beginning a long rebuild and their farm system isn’t exactly stacked. Get used to seeing them at the bottom of the AL East. Rookie outfielder D.J. Stewart has received back-to-back starts while brothers Caleb and Corban Joseph are on the bench. Joey Rickard usually starts vs. lefties. Breyvic Valera and plenty of September call-ups could see the lineup as well. Former Yankee farmhand Yefry Ramirez has seen plenty of innings in his rookie season, though he just returned to the rotation on Sept. 15 after spending a few weeks in the bullpen. He was sharp, allowing just one run over 5 2/3 innings, but he took the loss thanks to the Orioles’ anemic offense. On the whole, he has a 5.50 ERA in 55 2/3 innings. He’s dished out 4.9 walks per nine innings. Ramirez is a fastball-slider-changeup pitcher. His four-seamer works around 93 mph while his slider and changeup are both in the mid-80s. He works off the fastball while going to his changeup and slider at a 26.0 and 22.1 percent rate, respectively. Another game, another rookie. Despite David Hess throwing 91 1/3 innings this season, the Yankees have yet to face the right-hander. He’s made 17 starts and sports a 5.22 ERA thanks to a plethora of homers (19, 1.9 per nine innings). His 16.0 K% and 7.6 BB% don’t inspire much confidence, nor does a 1.42 WHIP. He’s a fly-ball pitcher pitching his home games at Camden Yards. Yikes. He goes primarily with a four-seam fastball in the low-90s while using his slider a fourth of the time. Other than that, he mixes in a low-80s changeup and a slow curveball. After throwing off a mound Tuesday, Cobb will likely start in this series, whether on Sunday or by slotting in earlier during the weekend. He lasted just two innings in his last start due to blister issues, though he lowered his ERA to 4.90 in the process. After a horrid first half where he allowed 17 homers and sported a 6.41 ERA, he’s been the Orioles’ ray of hope with a 2.56 ERA in his last 10 outings. If Cobb can’t go or takes the start earlier in the series, Dylan Bundy or rookie right-hander Evan Phillips could get the call Sunday. With Zach Britton on the Yankees, Brad Brach on the Pirates and Darren O’Day injured and a Brave, Mychal Givens has inherited the closer role. LHP Paul Fry has emerged as an OK middle innings option, albeit with a few too many walks recently. The rest of the bullpen amalgamates to a horrendous hodgepodge. This might be the last time Adam Jones comes to Yankee Stadium as an Oriole. It’s also almost certainly Buck Showalter’s last series against the Yankees as Orioles manager. Otherwise, this series is almost all about the Yankees’ attempts to clinch a playoff berth and put distance between them and the Athletics.